Contact us to order a custom Certificate of Death. 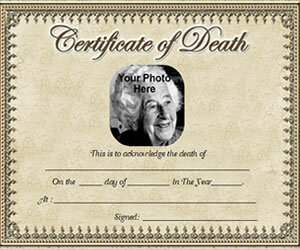 If you want to commemorate the death of a loved one, spouse or family member, you can make our own Certificate of Death using our blank certificates of death which you can fill in with an ink pen..
Each certificate has a fancy border and you can fill in the important information such as the name of the decedent, the date of the death, location of the death, and someone can sign off on the death certificate. This looks great printed out. Storing this keepsake in your family's memory book will allow you and your family members to have a printed record of family member deaths for years to come. If you want us to customize your information in the certificate, contact us. Free Printable Death Certificate - This blank printable death certificate template is a great way to remember someone who has died or passed away. Blank Death Certificate to Print - This blank printable death certificate template is a great way to remember someone who has died or passed away. Printable Death Certificate - This blank printable death certificate template is a great way to remember someone who has died or passed away. Free Death Certificate - This blank printable death certificate template is a great way to remember someone who has died or passed away. Fancy Certificate of Death - This blank printable death certificate template is a great way to remember someone who has died or passed away. Blank Printable Certificate of Death - This blank printable death certificate template is a great way to remember someone who has died or passed away. Simple Death Certificate - This blank death certificate template is a great way to remember someone who has died or passed away. Free Death Certificate to Print - This blank printable death certificate template is a great way to remember someone who has died or passed away. Printable Certificate of Death - This blank printable death certificate template is a great way to remember someone who has died or passed away. The Printable Certificate of Death are saved as Adobe PDF files. They are blank templates so that you can add your own text into. Simply open the Certificate of Death templates up and print them out using your printer. Next write in the decedents information and frame the certificate or place it in your family memory book!